I am not a huge fan of yellow but so glad I bought this set. The soft yellow with the gray gives a very relaxing feel to my bedroom. I would definitely recommend it. Brighten up your guest room with the charming Craigmore Quilt Set. White and yellow flowers line the embroidered grey background. Constructed from durable polyester and microfiber, the fabric is soft and conveniently machine washable. This will go down as one of "the best purchases of a lifetime". I certainly was expecting a decent product for the money, but it was much better than I had hoped. The quilting stitching is finely done, with no stray threads, and because of the close stitching, I am sure there will be no filling "bunching" after the first wash. The shams have lovely, strong ties instead of buttons (also avoiding button loss in your washer! ), and best of all, the set is REVERSIBLE! You get 2 sets in 1! I LOVE THIS ITEM! I don't often get this enthusiastic about an on line purchase. Most turn out okay or pretty good but rarely deserve superlatives. I LOVE this quilt set and was more delighted when I received it than with a product ever in recent memory. The colors are bright and happy without being garish. I had just redone my bedroom with light yellow walls and grey carpet so this was the perfect decorative addition. I got the king size to use on my queen size bed as I wanted to use it as a spread without needing a bed skirt. It is just the right size, hanging to within inches of the floor. I also love the feel and weight of the quilt which makes it lie smoothly on the bed and hang with a neat, finished appearance. I would unequivocally recommend this product. This quilt was prettier than expected, The colors are much brighter than pictured, which was a pleasant surprise. I purchased this for a guest bedroom, the walls are an olive green and the grey, yellow & white of this quilt really looks great with the wall color. Very happy with my purchase, highly recommend it, will brighten up any room. Bought this for my sunny back sleeping porch. The porch was painted white and this quilt was absolutely perfect for the bed! It is reversible, the shams have the reverse print of the back side where they tie. The quality is great, I would have paid more for this on sale at a brick and mortar store. I have a beach glass blue lamp next to it and the colors are beautiful together. I would definitely buy this make for my upstairs bedrooms if it came in different patterns. I highly recommend this quilt. I don't usually take the time to leave reviews although I shop on overstock often. Thanks again for a great product. I was looking for grey and this is just the right one for me! The while flowers are very brings and the flower centers are a lime green. I like that it is quilted over all, and the reverse side has a different pattern. It is light weight, but with the full quilting, it's a good year round weight. As with any order online - read the fine print. The KING size quilt comes with two QUEEN shams. You can order the king shams separately. It's always hard to find bedding for the master BR, which is attractive, comfortable, but not too feminine when the other half is a man! Both my husband and I really like this quilt a lot - ithe combination of yellow, gray and white is clean and colorful. Not too flowery, too busy or plain boring. It fits our King size mattress nicely, is soft and warm. It's medium weight, so in Wonter we will be putting a feather bed underneat for more warmth because my hubby says I keep the heat down so low you could hang meat in our room. I would love to find some coordinated curtains - I'm now on the hunt for plan panels in gray, yellow & white. I also bought the pair of King size pillow covers, so it's extra cozy with four colorful pillows. This was a great bargain! It's also easy to brush off the cat hair from my other bed mate! I bought this quilt for our guest bedroom. The old one was just yellow and white and very traditional. The graphics on this quilt bring our guest room into the 21st century! Adds color and pop with the yellow walls. I just love the bedspread. It is just as it was in the photo. Color is true. Bright and beautiful. Makes me smile! Love this quilt set! Feels like summer all year long! We ordered this for my 10YO daughter's room. It's the perfect mix of girly and a little grown up. I think she's going to love it for a long time. The quilt is pretty soft, but it's also thin. We live in a place with a mild climate year round, so it should be fine. But if you live somewhere with cold fall and winter nights you'll need something more. I was so tired of having a boring neutral pallet in my bedroom. After reviving some furniture and painting some walls this quilt and sham set finished the look! I was surprised with the great quality and so happy with the bright lively colors! Perfect! I could not be happier with this set! I love how it feels AND how it looks. It's absolutely perfect in the room, combining its modern look with a definite sweetness about it. Every time I go by that room and see it I smile. Very bright and pretty! Nice size, covers king size mattress on all sides. Only complaint is king size came with standard shams, however, I just used larger yellow shams to fill in gap. Haven't washed yet...so can't comment on after wash condition. But, I love the bright look, really wakes up my bedroom! Paired with yellow lamps!! Looks awesome and washes really nice. Always looks good! Gray is such a nice neutral color and it's nice to have the yellow pop against it. The fabric is good quality, the stitching is well done, and the set washes well. I am really happy with this purchase. Love the color and material. Very good for use with dogs. Great service and delivery! 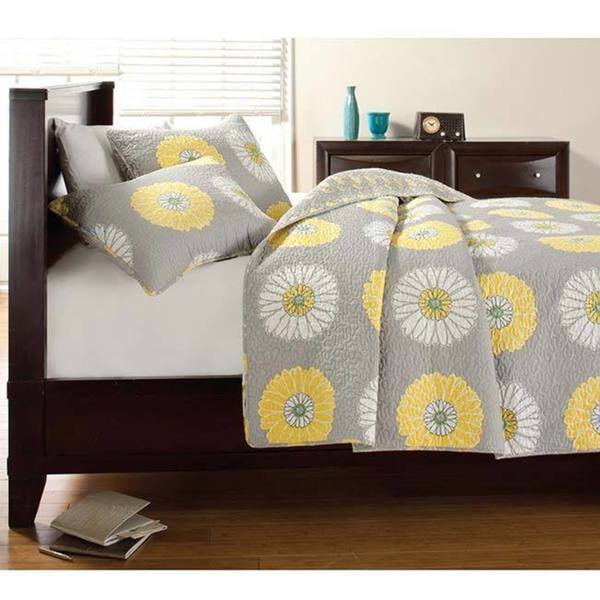 I bought two of these for my guest room (two twin beds), and they are beautiful!! Everyone who has seen them has complimented them, and the colors are exactly as pictured. The material of the quilt does not feel cheap. It's thick enough to keep you warm, but not too heavy or too light. It's soft to the touch and reversible. High quality quilts. LOVE these! Would highly recommend. Bought this quilt for my guest room. I love the yellow and gray together! The flowers give it a fun and clean look. The quilt is a very nice quality. Happy with purchase! I love the weight of this quilt. It forms to your body, but isn't suffocating. Just like I like it. The colors are exactly as shown in the pictures online and the quality is good. Been holding up well for over a year now. Looks great! It's a lighter weight quilt, which was what I needed. The color is exactly as shown. "Follow-up on the additional king size shams. There is an option to purchase 3 king size shams for $. What does that mean?" "Are the additional king size shams quilted?" Unfortunately no, the shams are not sold separately. "Is the fabric shiny, as it seems in the photos? " "Is there any green in the quilt? I have light sage bordered shams & wondering if they will match." Yes, there is a light green border right before the petals begin within the flowers. I would categorize it as a light kelly green if that helps. Good luck! "Please confirm the width and length for a king size bed." Hello Katherine R., the dimensions listed are correct. Thanks for shopping with us! "Confused here...the description reads as though he shams are included wih the comforter purchase, but there is a separate option to purchase shams? Please clarify if shams are included in purchase of he quilt. Thanks!" Hello nenalynn, yes the shams are included. There is the option for additional shams if you are interested. Have a great day!